“No AMI, no problem” is the message at DistribuTECH for residential demand response providers. For more than a year, there has been an agreement between Honeywell (NYSE: HON) and Opower, although the extent of the partnership was always a little vague. At DistribuTECH 2013, the partnership has materialized with a more concrete offering -- an integrated energy management platform. The platform brings together Honeywell’s Wi-Fi thermostat, Akuacom’s utility management software for demand response, and Opower’s cloud-based app. The combination is meant to drive greater participation in demand response and efficiency programs, the latter of which have mostly been Opower’s focus in the past. Pacific Gas & Electric is currently testing the platform for energy efficiency with about 500 customers. Four other utilities are also running pilots. Residential demand response is a hot topic at DistribuTECH. Comverge announced its latest IP-based broadband offering for home load control at the tradeshow in San Diego. On the efficiency side, the app begins by asking customers some basic questions to help set up their smart thermostat correctly. Just that move can save up to 20 percent on air conditioning and up to 15 percent on heating, according to Opower. Other companies in the sector also have similar setup procedures that take the guesswork out of programming a smart thermostat -- which has historically been a problem for the average consumer. For Honeywell Opower’s platform is only a utility offering and therefore not available in the direct sales channel. Utilities can use the solution for either energy efficiency or demand response, or start with one and evolve into the other. The decision for most utilities comes down to their regulatory structure. Opower also released an updated mobile platform with thermostat integration, outage reporting and more customization than in the past. Enhanced mobile solutions and more flexible demand response were the name of the day at DistribuTECH beyond just Opower and Honeywell. Energate is another company that expects to announce big contract wins in 2013 and has a broadband connection solution that doesn’t require AMI. Integrating energy efficiency and demand response programs with sophisticated consumer engagement platforms might sound like a no-brainer, but it’s been a careful evolution that is still ongoing for the utility industry. Energate, for example, is just starting to put Wi-Fi chips in its smart thermostats, because until recently, no utility had asked for them. Now utilities are asking if there are cheaper ways to get verifiable load drop from homes, namely through using gateways that are already in the house, whether that’s a router or a set-top box. 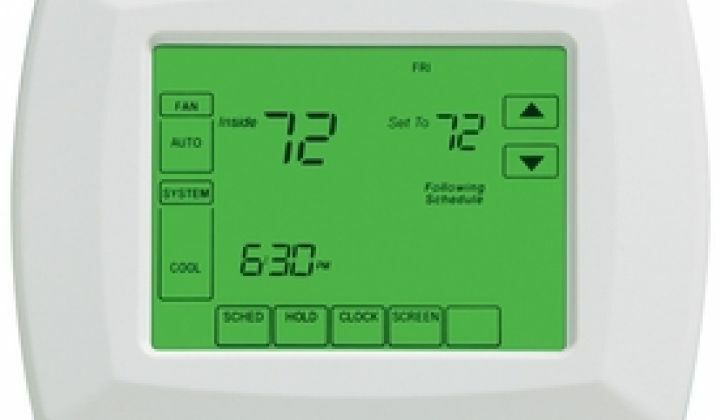 Some utilities are also looking at leveraging smart thermostats already in their territory through various third parties, whether that’s Earth Networks, Alarm.com, EnergyHub, or now Honeywell. For utilities that need peak shaving, there is also a high correlation between the homes with the biggest loads and those that have Wi-Fi, said Alex Kinnier, SVP of product management at Opower.